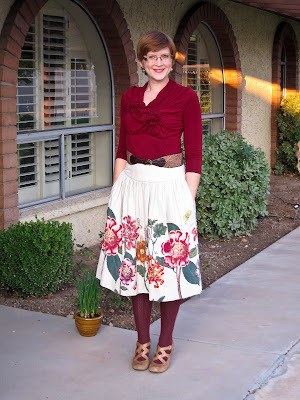 I've been at the park all morning, and working in the yard all afternoon, so I thought when I finally got dressed at 5 pm, I would don my most favorite, beautiful flower skirt (with pockets!) in honor of this beautiful December day. I actually don't mind raking leaves a bit - they're a nice, minimally intrusive souvenir of those things other people call "seasons". Since we only have two (Hot and Gorgeous) and the leaves fall in Gorgeous, I am happy to participate.